Of this week's IRL contributors, two have already tried out that replacement for iChat. For the purposes of this column, though, all three are waxing on about something very old, at least by early adopter standards. For starters, James still get the warm-and-fuzzies holding his Nokia N800 Internet Tablet, despite its crawling page load times. Joe, our resident audio guru, explains why he tosses a reference to Bowers & Wilkins' P5 into almost every one of his headphone reviews. And the object of Mat's affection -- a laptop skin -- slipped under our radar when it came out over a year ago. So is James actually still using that N800? What's Joe's obsession with B&W? And why would anyone spend $50 on a notebook prophylactic? Read on to find out. 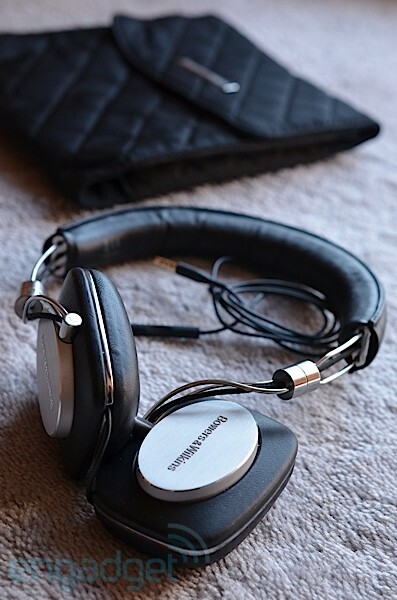 Time and time again, I find myself referencing Bowers & Wilkins P5 headphones in reviews. Strangely, though, I've never actually given my full opinion of these leather-clad cans. At $300, they fall into the wallet-thinner category, and while some might balk at the thought of spending that much for iDevice-optimized 'phones, they've proven to be worth nearly every penny. Off the bat, they just ooze class, thanks to the brushed metal accents -- you could wear them with a suit and still look dapper, as far as I'm concerned. Furthermore, the included pouch brings the experience a measure of luxury usually reserved for fine jewelry. I'm picky when it comes to fit, but B&W has struck the best balance of portability and comfort I've experienced yet. The sheepskin leather is incredibly smooth -- not to mention, padded with memory foam. And unlike many headphones using the stuff, it actually comes close to that Tempur-Pedic sort of feel. Of course, it does help that these headphones are ridiculously flexible, and also lightweight, at just under seven ounces. Plus, whenever I need a break, the earcups can twist flat and rest on my collarbone. Notably, their closed-back design offers such good passive noise isolation that they've rivaled every active noise-cancelling headset I've used. The audio is quite good for the size, and it's comfortably voiced for long listening -- a thick, dark sound with relaxed highs and an acceptably sized soundstage. That's not to say they're bass-heavy; more that the sound is exceptionally warm. Of course, if you prefer gobs of treble above the mix, look elsewhere. Naturally, I have some nitpicks. For one, the included cables need improving. You might think it's their thinness (I'm a fan, as there's nary a trace of cable noise), but it's actually the straight-angle jacks -- a nightmare when your PMP is in your pocket. I managed to snap the jacks on both cables through routine snags, so it's good that the cables detach easily from under the left earpad (the pads attach magnetically). A switch to a right-angle plug would greatly improve their durability. Thankfully, B&W covered my breaks under warranty as a one-time only deal, so I can at least attest to a pleasant customer service experience. The other fault lies in the iPhone remote / mic. Although it feels great for controlling playlists, the onboard microphone picks up loads of ambient noise -- so much so that I generally have to pull the mic up to my mouth. Interestingly, the company's C5 in-ears use an improved mic that better focuses on vocals, so hopefully it'll eventually make its way to the P5. These complaints aside, the P5 headphones have been my daily drivers for over nine months, and I'd recommend them to anyone looking for an awesome set of portable cans. That said, we'll see how I feel once Sennheiser releases its HD-25 based Amperior in the coming months. MacBooks play a substantial role in our live coverage, mostly thanks to the Mac-only dongle we use for on-the-fly video encoding. So, not long after I took the plunge for the job and bought an Air. That initial cash injection cranked up the paranoia of damaging what's possibly my most expensive purchase yet. Out of all the carry cases and laptop skins, there were two reasons why I decided to stump up a little extra cash for one of Speck's wafer-thin (and presumably high-margin) MacBook cases. Sure, there were other shells, but it's this one's glossy finish -- it was love at first touch. Factor in a heady dose of longing for the (unfortunately discontinued) black MacBooks, and you can see how I ended up with the black-finished Speck cover for my 13-inch laptop. The casing comes in two parts, with a single flat half for the screen's backing and a slightly deeper shell to cover the base and sides of the device, leaving ports accessible and offering up four slightly more tactile feet to stabilize your MacBook on desks and the like. That's not to say it's completely perfect. Minor whinges: the shell protects your Mac, but scratches appear white on the matte surface -- and these are particularly pronounced on my black case. Also, the nubs that stretch out over the keyboard half still have sharp burrs on them, making typing mildly hazardous for work-shy, soft-handed types like myself. Still, a confluence of four Speck-shelled MacBooks in Engadget's CES trailer alone is a sign that perhaps Speck is doing something right after all. Way back in 2007 I made a purchase that changed my life: I bought a Nokia N800 Internet Tablet. Why was this significant? Well, it's probably the first major tech purchase I made where I had absolutely no need for it, but justified it to myself all the same. 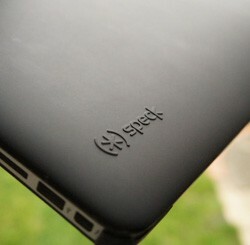 In essence, I confirmed myself as a gadget lover -- heart won over head. That's not to say the N800 itself was useless; it just did lots of things I didn't know I needed. There was just something about the idea of the device that sung out to my inner geek as, like many Nokia devices at the time, it was extravagant and experimental in equally seductive measures. Back then I was working as a systems administrator for one of the UK mobile networks, which meant lots of Unix, SSH and other such network shenanigans, and this is loosely where the N800 was meant to fit into my life. I loathed mobile internet back them, navigating via a tiny Symbian screen was no fun at all. 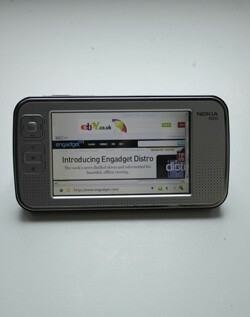 With the N800 I was liberated from this tyranny and had a full 800 x 480, 4.13 inches to play with. Also, the Tablet OS was Linux-based, and supported by an active developer community, so there was a good deal of clever (if somewhat basic) apps to play with. In practice, the internet experience via the N800 had its pitfalls. Getting WiFi on the go was a struggle. Even if you did find an open hotspot, connecting was be hit-and-miss, and pages seemed to render endlessly, making clicking and pointing (with the already average resistive screen) a chore. Likewise, I never understood why Nokia didn't endow its internet tablets with 3G -- this would have majorly legitimized the device as a true portable internet gadget. In fact, I spent half the time explaining to curious friends that although this was a Nokia, it wasn't actually a phone of any sort. No doubt, the folks at Espoo had good reason for this omission, but as the iPhone would prove in the same year, it might have been a costly one. Despite all of this, as I took the N800 out of its hiding-hole for this column, I still got a solid twitch of inexplicable excitement.